Some of this information comes from the listings of Non-Prefixed and Non-Suffixed aircraft reviewed by me in the archives of the National Air & Space Museum (NASM), Washington, DC. Scheppler, Robert H. 1966. The Fokker F-32. 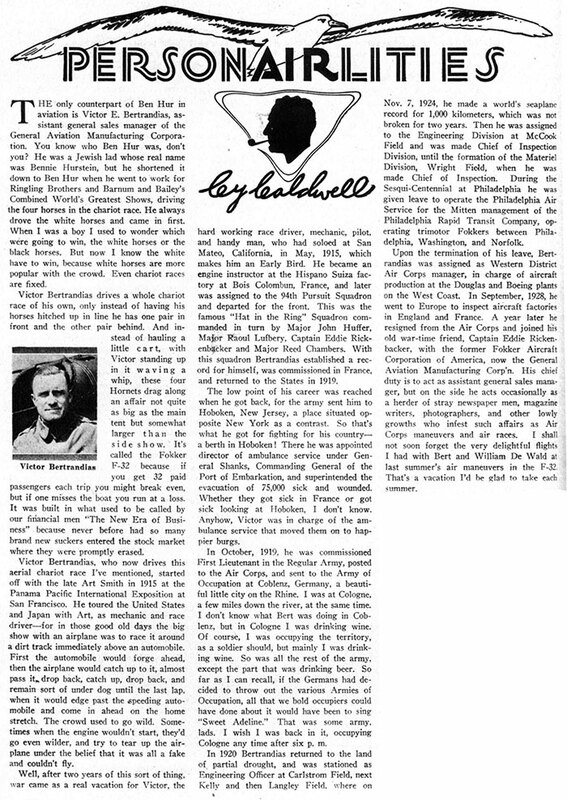 Journal of the American Aviation Historical Society. Summer, 1966. Hamilton, Hayden. 2012. The Fokker F-32: The First Wide-Body Airliner. Journal of the American Aviation Historical Society. 57:1. 15-23. I'm looking for information and photographs of this airplane and pilot Morehouse to include on this page. If you have some you'd like to share, please click this FORM to contact me. This large aircraft is a Fokker F-32, S/N 1204, the fourth of its kind, manufactured in March, 1930. It left the factory with four Pratt & Whitney Hornet B engines (S/Ns 592, 593, 618 & 621). It could carry 32 people. NC334N and its sister ship, NC333N, were the first four-engined commercial aircraft operated in the United States. It was purchased and flown by Western Air Express (WAE) of Los Angeles, CA (WAE was later merged to TWA). It was one of only seven (or 10, depending on your source) built. It was only a month in service before we find it at Colorado Springs. It would stay in service less than a year. 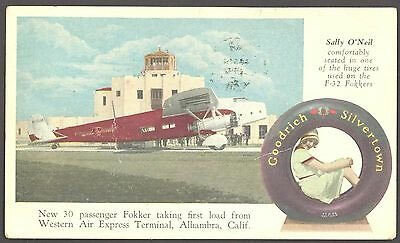 Photograph, left shows the airplane rendered in color at its western terminus, Alhambra, CA. Note the woman posed in the Goodrich tire (see below). 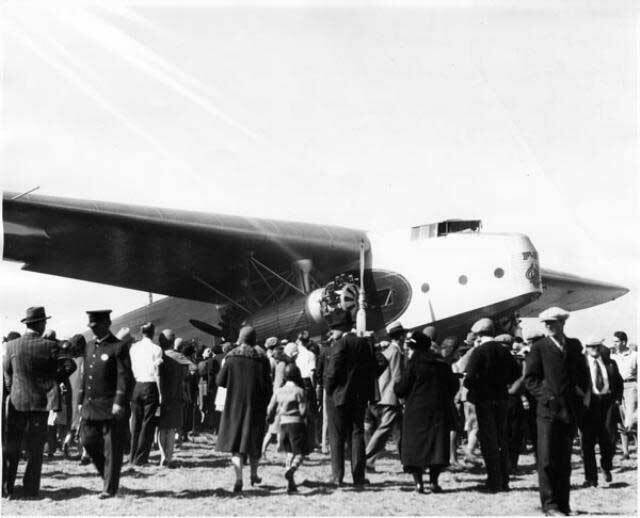 As a brand new airplane, it landed at Peterson Field on April 7, 1930 at 8:45AM. It was flown by Silas A. Morehouse with a crew of three. According to the Register, they carried 26 (out of a possible 30) passengers on a transcontinental voyage from New Jersey to Hollywood, CA (see below). NC334N arrived at Colorado Springs from Denver, CO. After two hours on the ground, it departed for Pueblo, CO the same morning at 10:45. It was part of a flight of two, NC333N and NC334N. 333N is not recorded in the Peterson Field Register. However, NC333N landed 17 times and appears in the the Grand Central Air Terminal Register flown by several pilots. 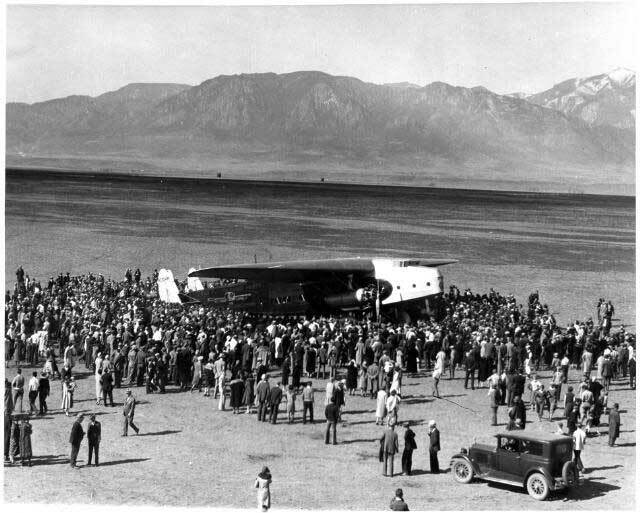 From the crowds, and the news coverage exhibited below, it's clear that these first flights across the country were big attractions for local populations wherever the airplanes stopped. Below, courtesy of the Pike's Peak Library District (PPLD) Special Collections, is a stunning photograph of NC334N on the ground at Peterson Field. The foothills of the Rocky Mountains are in the background. Compare this photo with those at the Peterson Field page. Although the registration number is not visible on the airplane, the date of its appearance at Peterson Field, as well as a couple of other resources identified in the left sidebar, identifies it as NC334N. The identification is corroborated by John Bybee, who identified the airplane in the photo as NC334N because of slight differences in the wording painted on the fuselage. Note the radio antenna mast above the fuselage just visible above the starboard wing. 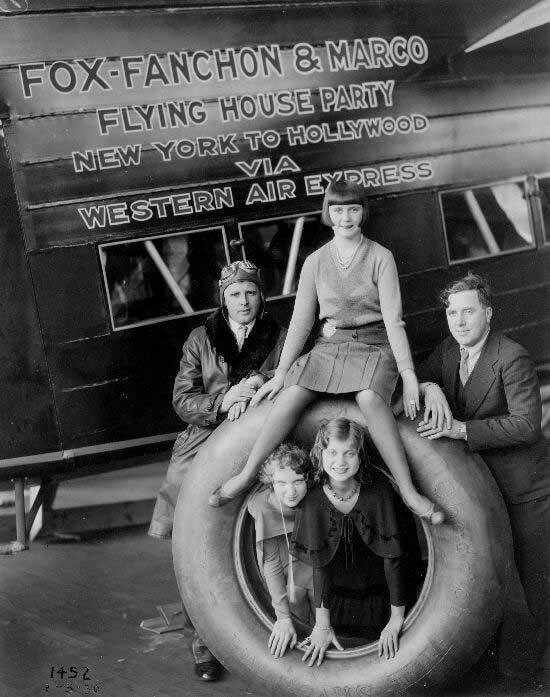 According to PPLD, "Fox Flying House Party" and "Western Air Express" are written on the plane and the photo is inscribed on the back as "Fokker F-32 4-7-1930." Below, a photograph courtesy of the San Diego Aerospace Museum Flickr Stream (SDAM) showing a closeup of the fuselage lettering. The "compact" lettering above the windows descibed by Mr. Bybee identifies this airplane as NC333N, the sister F-32 flown along with pilot Morehouse's NC334N. An online blog discusses the F-32 and the Fanchon dancers at the link. Please let me KNOW if the content at the link is no longer available. The gentleman on the left is Morehouse; on the right is Jimmie King, the co-pilot. There is good similarity between this photograph and the portrait on his biography page linked above. The women are members of the dance troupe. They are Alma La Blane at the top, and Margaret Slater (L) and Anne Allen inside. They add dimension to the large Goodrich tire (Goodrich can be read near Alma's left foot), which was the largest tire ever manufactured until that time. Regarding pilot Bertrandias, the article below from the November, 1931 Aero Digest magazine cites his duty flying the F-32. It also describes a little about his life in the rambling prose of the author, fellow Register pilot Cy Caldwell. 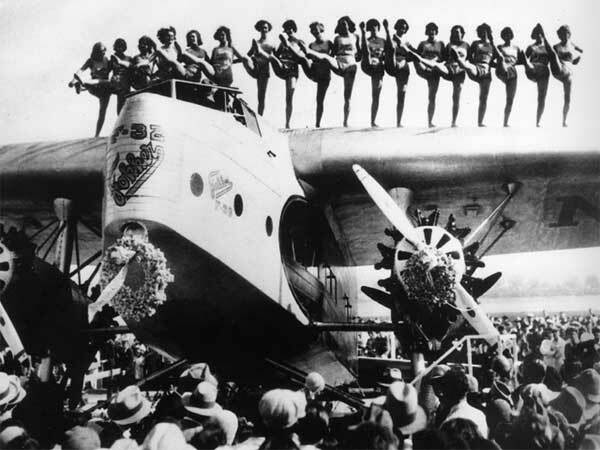 This photograph appears to be either a celebration of the beginning of the two Fokker's inaugural flights, or a celebration of their arrival in Los Angeles. In the PPLD photograph below a crowd stands near NC334N at Peterson Field. 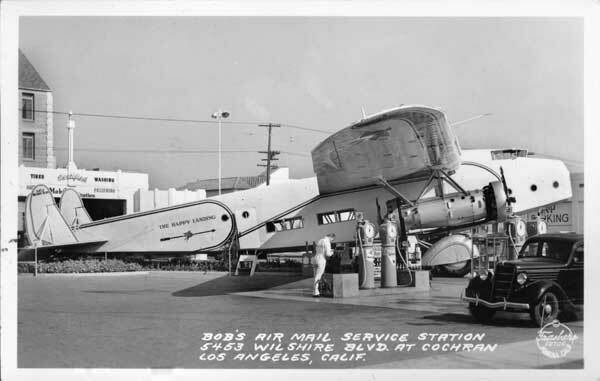 Written on the back of the photograph: "Western Air Express / New York to Hollywood / 4-7-1930." A great photo at Grand Central Air Terminal of one of the F-32s is at the link. Note the engines running and the pilot looking out the cockpit window. This photo provides a nice look at activity behind the airplane. Please let me KNOW if the link is inoperative. 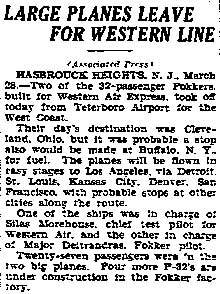 Earlier, the departures from the east coast of NC334N and NC333N were captured in the Trenton (NJ) Evening Times of March 28, right, and The New York Times of March 29, 1930, left. Pilot Morehouse is cited in the NJ article. The itinerary, which took the aircraft through Denver, brought our airplane to Colorado Springs on April 7, eleven days after they departed Teterboro airport in New Jersey. The pilot of the other airplane was Victor Bertrandias (name misspelled at right). He is identified as Fokker's chief test pilot. 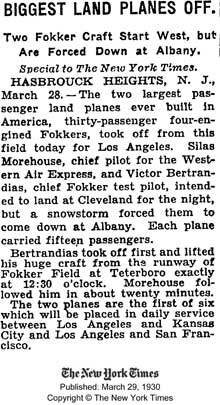 Both airplanes had to land at Albany, NY due to a spring snowstorm. The four 575HP Pratt & whitney Hornet B engines on the F-32 were arranged in tandem pairs under the wings on each side, one tractor and one pushing (see the photo just above). The tractor carried a two-bladed propeller; the pusher was three-bladed. Besides being the first four-engined transport, it also was the first with twin seating on both sides of the center aisle, the first with a galley to prepare hot meals, and the first to carry two passenger lavatories. Despite these innovations, the airplane as a type was not successful in commercial service. The engine geometry led to overheating and extensive maintenance expenses were incurred to keep them running. 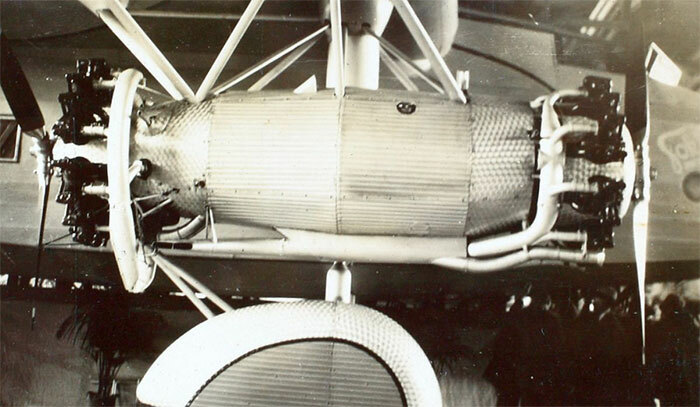 Below, from the SDAM, is a photograph of the tandem engine geometry. The forward engine is at left with the three-bladed propeller, and the rear one is on the right (two-bladed propeller). With money in short supply as the Great Depression worsened, the F-32s were phased out of service near the end of 1930, soon to be replaced throughout the airlines by the Boeing 247 and the Douglas DC-3. 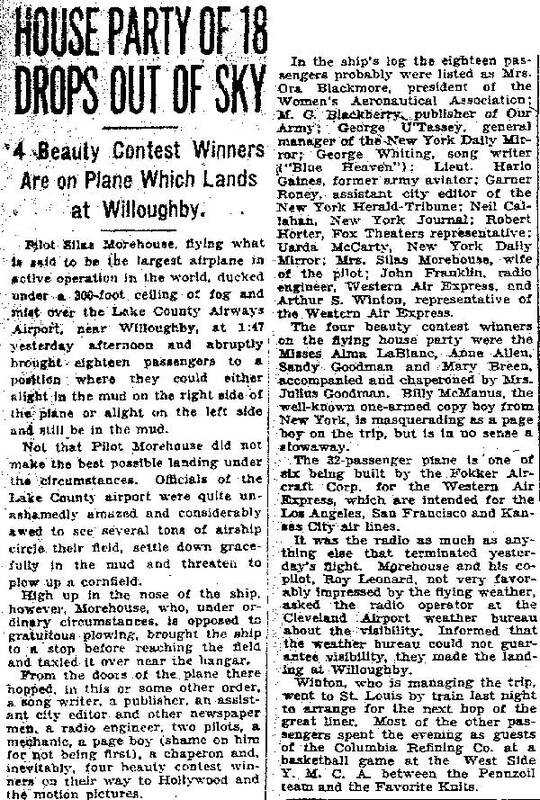 Another slightly more informative news article, below, from the Cleveland Plain Dealer of April 2, 1930 has the aircraft making another unscheduled landing due to weather at Willoughby, OH. Morehouse is again cited, this time making a safe landing under a low ceiling. Regardless of the landing conditions, the passenger list in Morehouse's airpane is cited in the article. It was a diverse crowd, including Morehouse's wife. Nine days after their east coast departure, and a day after the landing at Peterson Field, we find the airplanes at Kingman, AZ. In the article below, from the Mojave County Miner of April 11, 1930, we learn the color of the aircraft. The dark parts of the airplane in the photos above were actually bright red. The nose was white. The stunning colors, combined with the roar of four radial engines (and the dust), must have been a great crowd pleaser. 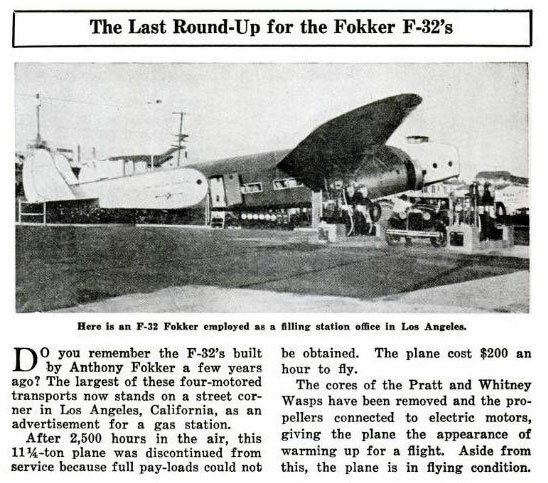 "At 11:00 on Tuesday morning, two Fokker F-32 passenger planes landed at Port Kingman on their way to Los Angeles from New York. All of Kingman came out to watch the landing of these two special looking airplanes. They refueled and headed towards Los Angeles. Western Air Express bought the two planes for coastwise service. These giant red birds will carry 32 passengers including the crew. Instead of three engines, this plane has four engines, two in front and two in back. During landings and take-offs, they were graceful. The main passengers of the two planes were members of the Fox Film Corporation. Also painted on the sides of the planes was 'Fox Flying House Party.' Most members were needed on the west coast for work. An hour before a pair of Fokkers F-10 landed along with group of Army Pursuit and Scout planes." The final disposition of the airplanes is clearly published. NC333N was cut up and salvaged for parts in 1931. According to information I reviewed about NC334N at the Smithsonian, "In a letter to the CAA dated July 19, 1933 T.W.A. advises that this airplane has been retired from service and useable parts salvaged." The remainder of NC334N met a novel, though ignominious, end. It wound up, below, as a static attraction at a Los Angeles, CA service station, standing out front to greet patrons. The propellers appear to be dummies. It was painted with the Mobil Oil Pegasus logo and named "The Happy Landing." 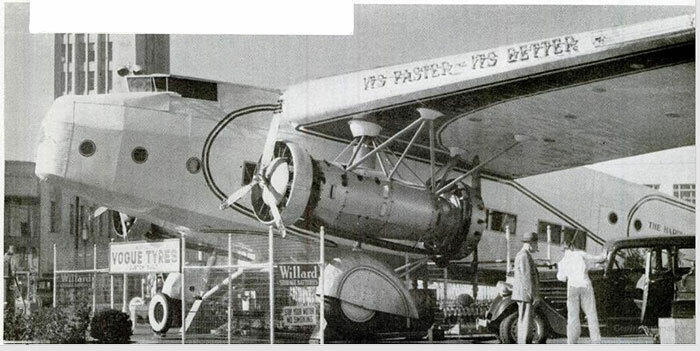 Below, a photo from Popular Aviation (PA) magazine, January, 1935, shows the same scene, but the passenger door is open, the paint scheme is different, and the propeller appears to be missing. For comparison, some small private airplanes today can cost about $200 per hour to fly. NC334N was totally scrapped before the 1930s ended. Below, again from Popular Aviation magazine, is a September, 1939 view of the airplane from the port side. This must be one of the last photographs taken of the airplane. Note "It's Faster -- It's Better" rendered on the leading edge of the wing, which appears to be flattened to accept the signage. Of course with a display this unusual it had to show up at the end of a cartoonist's pen. 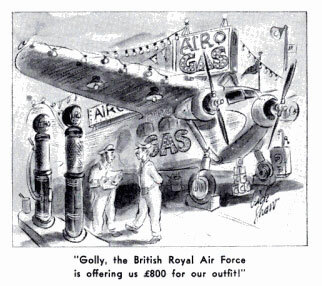 At right from Popular Aviation (PA) magazine, November, 1940, is one version. The humor lies in the fact that WWII was quickly approaching and the British had already been exposed to it for almost two years. They were reaching out for airplanes and other supplies to build their armory. NC334N probably wouldn't have done them much good.